With hundreds of events every year, Ahoy was looking for a secure and flexible locking system with maximum manageability. 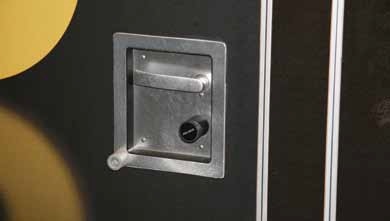 The present mechanical locking system was no longer ‘watertight’ due to the loss of keys. The solution also had to adapt to the existing access control system. Registration, authorization and security. Ahoy had a number of requirements for its new locking system. Around 150 doors in the Sport Palace and the Plaza were equipped with Aperio™. Aperio™ made a simple security upgrade possible. Customer installation costs were limited by only minimal modifications to the existing doors and by making use of the existing card readers. for each door. With the easy to expand with Aperio™ wireless lock technology, Ahoy is well prepared for the future.